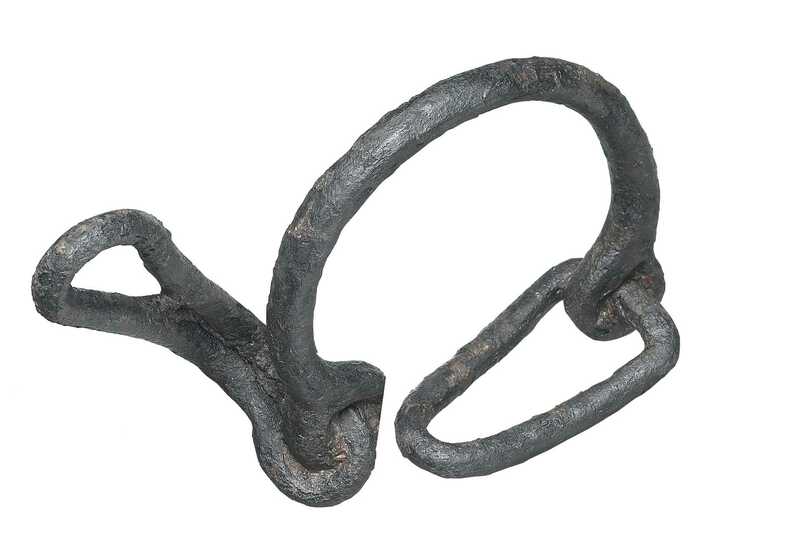 This shackle is almost certainly related to the keeping of prisoners or slaves in Roman London and is a very unusual find. The marshy layers near the Walbrook also produced some very unusual objects. This iron shackle, decorated lead disc and crushed iron candlestick were found in the same layer. It isn’t known if they were originally buried together. The candlestick and the disc are similar to objects that have been found at temples and may be votive offerings. The disc is thought to represent a mirror. The shackle is almost certainly related to the keeping of prisoners or slaves in Roman London and is a very unusual find.